When a restaurant wins a James Beard Award for the best in the country, it gets my attention especially if it’s located in a city where I happened to be going soon. 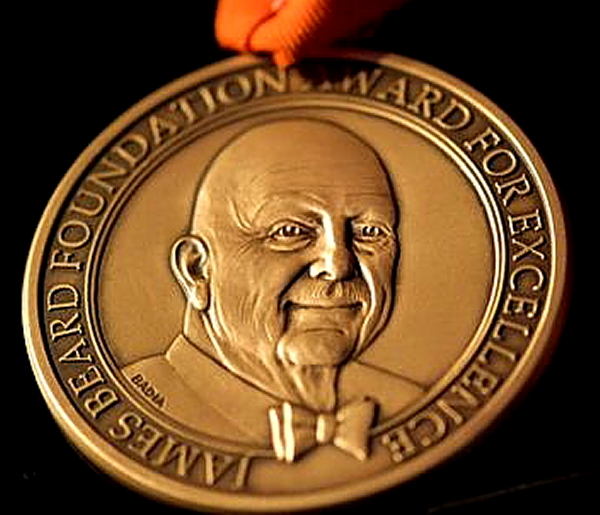 My daughter Kristina lives in New York City and has attended several of the James Beard Awards held at Lincoln Center. The evening she returned from the awards this year, she called and said that since we would be in San Francisco soon, we should make a reservation. Kristina decided it was a good idea to call immediately because after the announcement, they would be inundated with reservation requests. She got the last available one of the day. 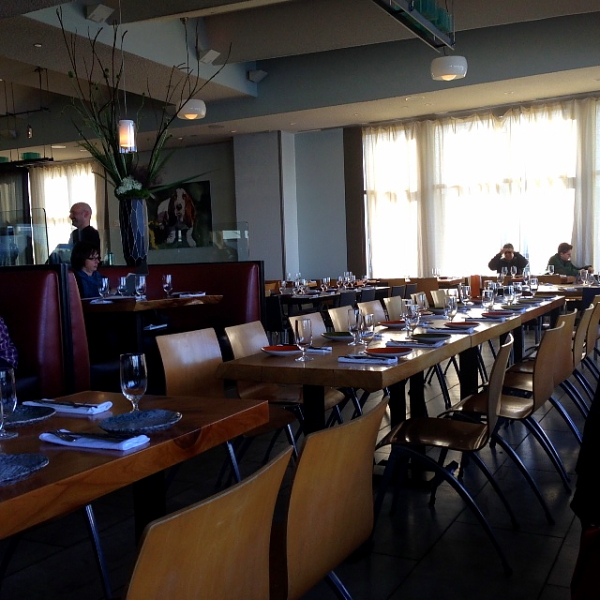 The Slanted Door is located at the Ferry Building in the Embarcadero. 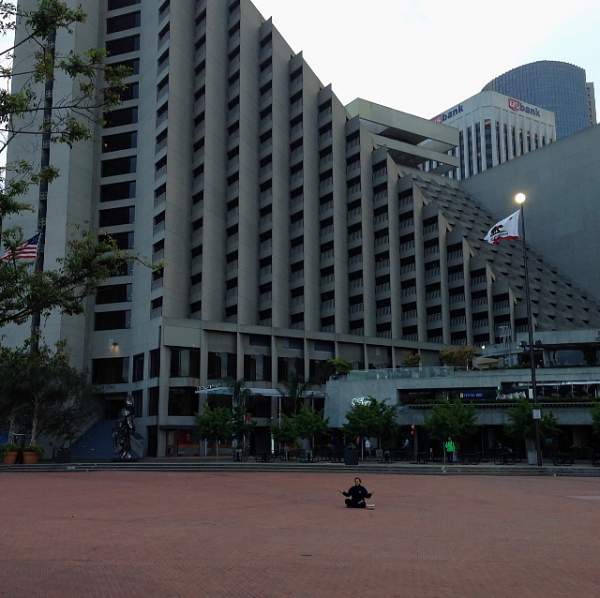 It’s an unassuming sort of place, blended in with many other stores and restaurants of the building. When we arrived for our 5:30 reservation, it was almost empty except for the bar area which was noisy with patrons and tourists, probably waiting for their reservations. 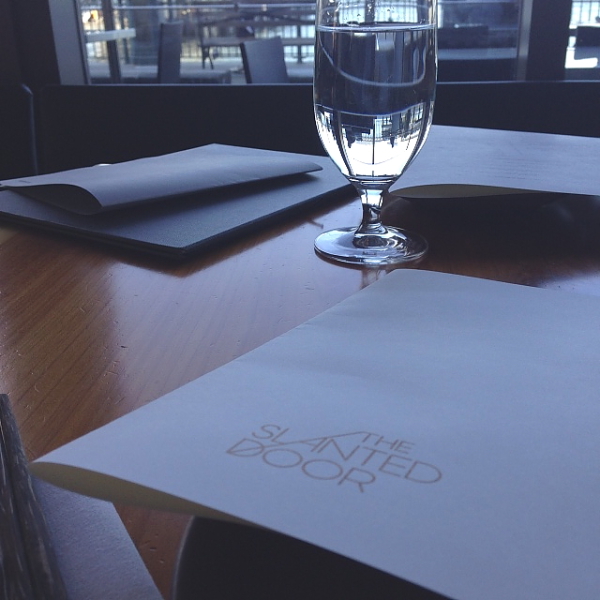 Kristina and I were one of the first to be seated and scored a table right by the window. 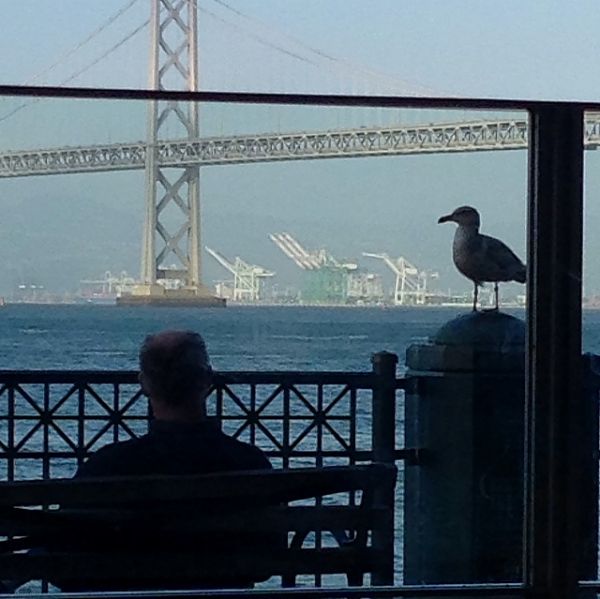 Not a bad view, don’t you agree? The server brought our menu, but we didn’t even look at it right away. The place started filling up fast, and we were content to people watch and enjoy the view. 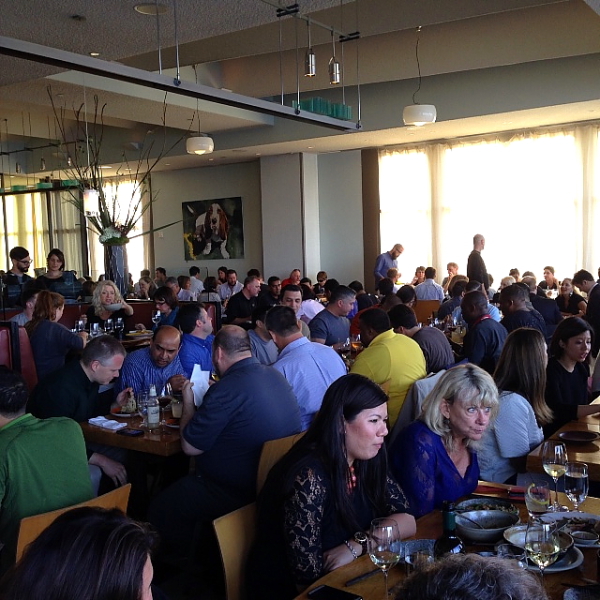 Before we knew it, it was packed and noisy. We finally turned to the menu and decided to start with a couple appetizers. My friend Priscilla lives in the area and has been to the restaurant. She recommended the Imperial Rolls. It was a good choice. 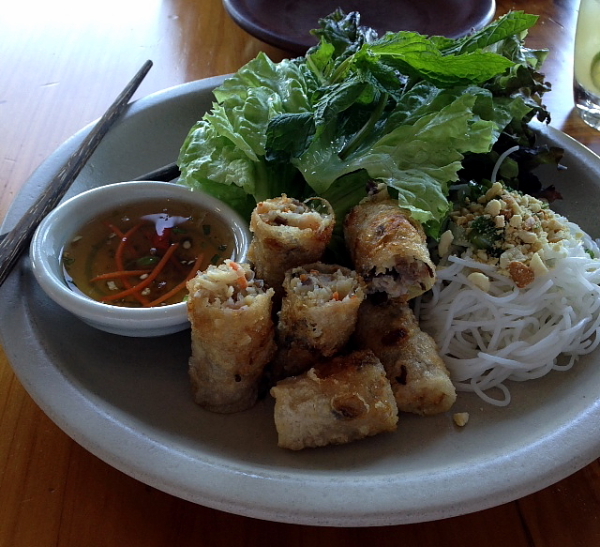 The crispy rolls were filled with gulf shrimp and pork shoulder, served with vermicelli noodles topped with peanuts, and a spicy sauce for dipping after the rolls and noodles were encased in a lettuce wrap. Another appetizer was the baby fava beans. Kristina and I are both crazy for fava beans, so it was a no-brainer to order these. 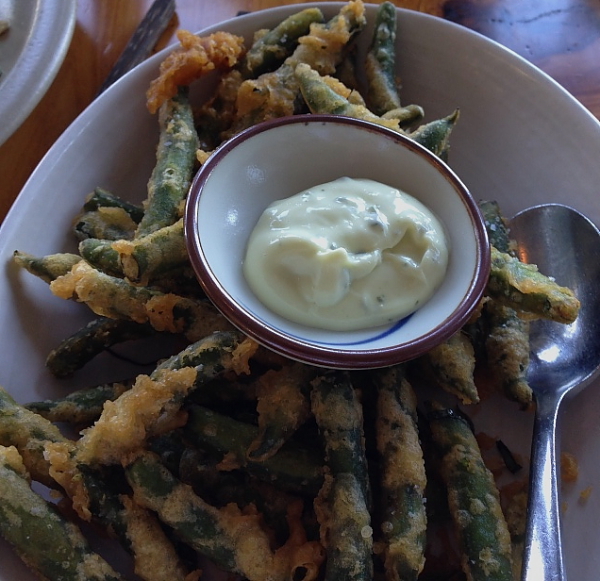 They had a light crispy coating with chili-lime sea salt and served with a Thai basil aioli. We could have eaten more of these and made it a meal. They were completely addictive. 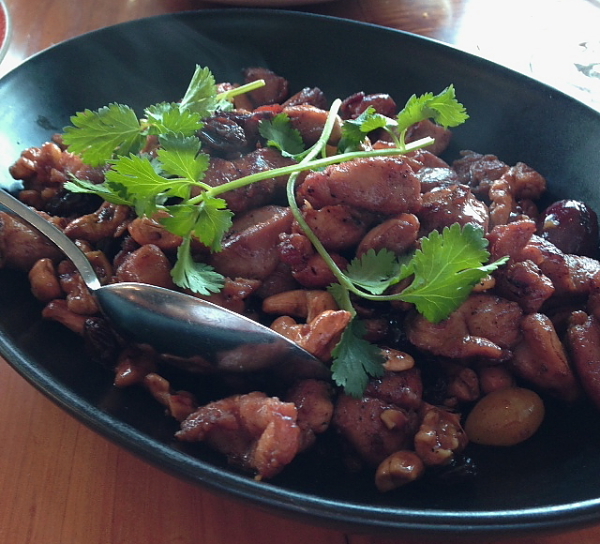 Next was the stir-fry organic chicken with walnuts, cashews, Chinese dates, and raisins. It was delightfully crunchy and sweet. 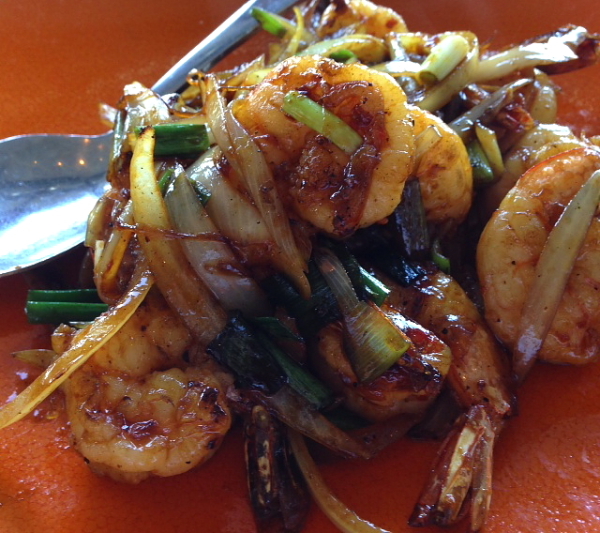 The caramelized wild gulf shrimp had garlic and onion in a caramel chili sauce. 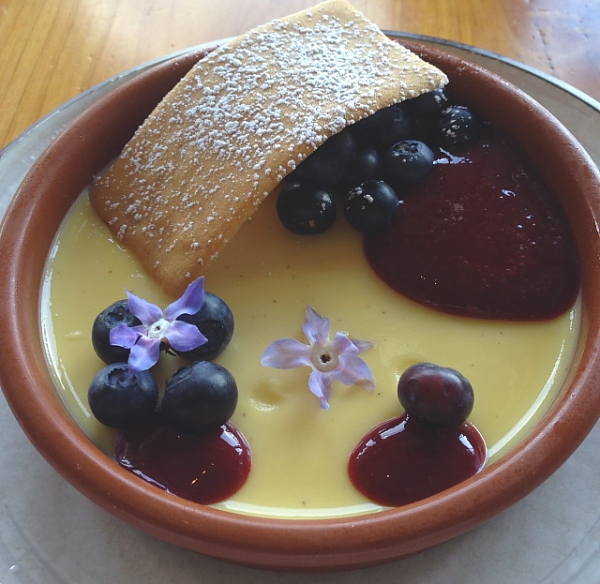 The honey-lavender Pot de Creme was as good as it was beautiful. It had blackberries, blueberries, borage blossoms, and a crispy lavender tuile. By now the sun was starting to set and as we walked back to the car, we faced a beautiful sunset over Coit Tower on Nob Hill. 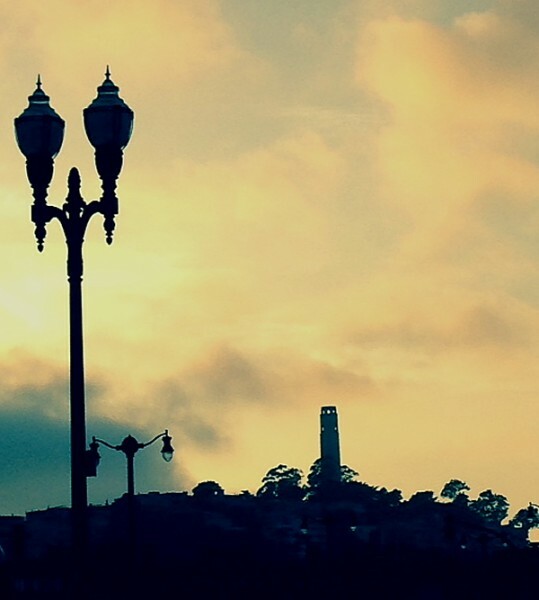 Some things have never changed since I moved away from the San Francisco area long ago, but one thing I know for sure. I will never paint and sell rocks again. But my girls will tell that story forever. 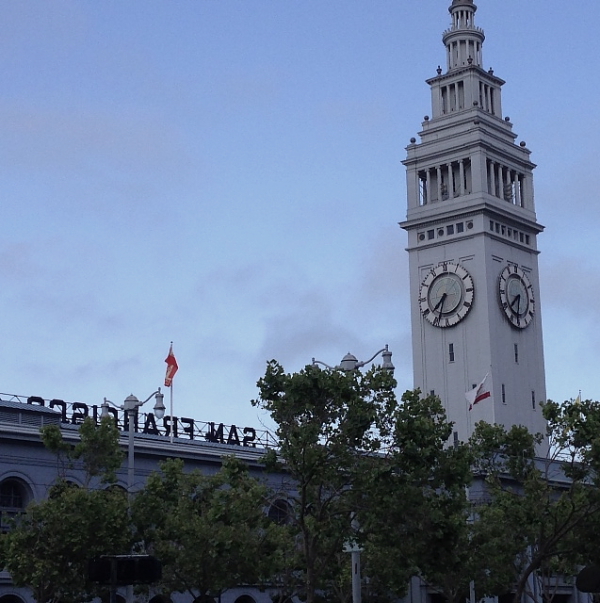 Wonderful reading about your fun in San Fran! What a ‘tasty’ time!